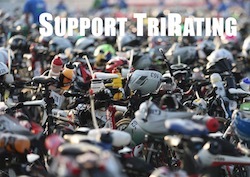 I’m working on another new Kona feature utilizing my data: kona.trirating.com will show the “TTR Kona Live Predictions”. By live predictions I mean a mixture of actual race splits and my predictions (as released in my “2013 Kona Rating Report“), updating as soon as new splits are available. You can easily see who may be a bit back, but still in a good position to win the race, who fell back a bit because of a slow swim and so on. All this information is easily available however you want to view it, you can sort the results table simply by clicking on the column header. For now, I’ve put up a page with the current start list and my pre-race predictions and a sample page with some background information. I will update the “TTR Kona Live Predictions” as the race develops and hope that it’ll be a helpful feature for those following the race. Let me know if you have some ideas how I can improve the data even further! For those that want to have the full on statistics, you can still download my free 2013 Kona Rating Report.